Some designs can only be considered obscene and the Ultima class system platform is definitely in this category. 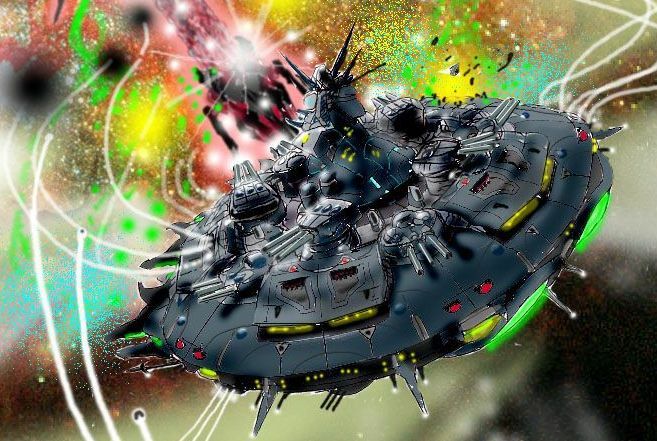 The platforms are far larger than any other starship designed by the United Worlds Warlock and is among the largest designs in the Three Galaxies. They are only used as a system defense platform on the largest and most important system within United World Warlock space. A total of fourteen platforms were built soon after the founding of the United Worlds Warlock but the platforms were considered too expensive to complete anymore. A total of only two platforms have been destroyed. There are many in the U.W.W. Navy that consider the platforms to simply be too expensive and obsolete. Most of them prefer more a mobile system defense such as Monitors. Some Naval leaders also prefer asteroid based platforms because they are far cheaper. The Ultima class system defense platforms had to be shipped in pieces and final construction was done within the system they are to protect. They were also incredibly expensive and took up to ten years to assemble. The construction of the Platforms was by Dwarven engineers, many who worked on the Dwarven Iron Ships. While the standard U.W.W. Monitor is also assembled in the system, they are much less expensive and can be assembled in a much quicker time-frame. While the system defense platforms are quite old, the military has been steadily upgrading their defense platforms with better electronics and improved point defense weaponry. Due to the extensive resources invested into the platforms, there is no plans to decommission the platforms but instead the platforms will receive a large scale upgrade. Only three platforms have been upgraded and many of the remaining platforms probably will not be for several decades. Upgrading mobile forces are considered a priority although fighters will probably be replaced on most platforms before upgrades are complete to the platforms. One of the items that makes the Ultima so unusual is its appearance. While the U.W.W. Black Swan class battlecruisers look like ancient earth Battleships, the Ultima is very different. It has some similarities to a naval ship but is quite unusual when compared to them. Instead of a pointed bow and stern, the bow and stern of the vessel are virtually non existent and the vessel is virtually round. The platform shares many feature with Dwarven Iron Ships including the fact that the plates are actually riveted together on the platform and the Platform looks like something from ancient history. The plates which the platform are constructed from are not a high tech alloy but instead enchanted plates similar to those used on Dwarven Iron Ships. Most later ships, including the U.W.W. Battlecruisers use high tech alloy plates because they are far less expensive and easier to replace. Still, many features first mounted on the Ultima class were later used on the battlecruiser class. These include 16 inch flame cannons in triple turrets. The platform carries a total of twelve heavy mounts with eight on the top and four on the bottom. The firepower carried on the system defense platform is incredible. 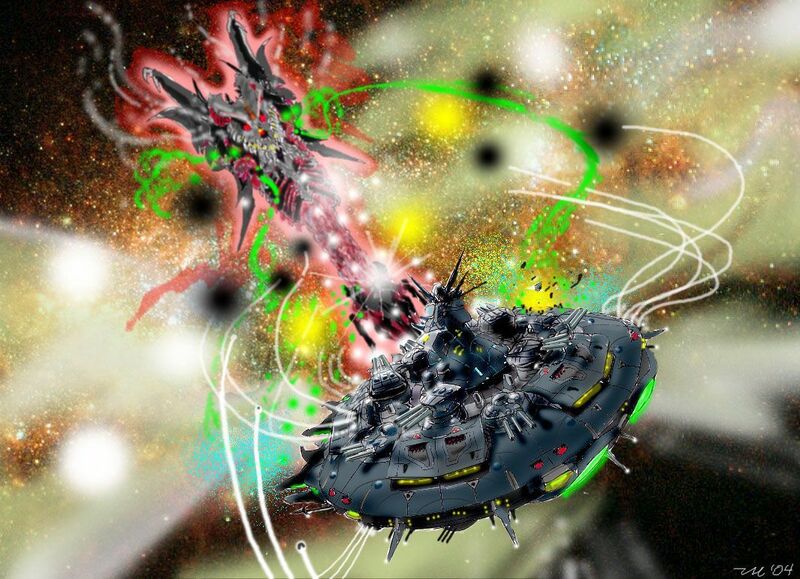 The thirty six flame cannons are capable of fighting virtually any ship within the Three Galaxies. One trick is to spin the platform at high speed and open fire with all weaponry at the same target. Due to the incredible firepower of the flame cannons, designers saw no need for secondary heavy weaponry and does not mount any heavy lasers like the Dwarven Iron ship. The platform mounts a single Rifts Cannon in its rounded bow. Point defense weaponry is scatted around the platform to protect it from missile strikes and fighters. These have been upgraded several times during the platforms’ service and consist of four dozen Sub Particle Acceleration cannons and the same number of Twin TK-Machinegun turrets. In small bays around the platform are bottled demon launchers with eight on the forward, port, starboard, and aft sides. Under the top mounted forward, aft, and side turrets, the platform has large bays for embarked craft. While the platform does not mount any cruise missile launchers, many see the large compliment of fighters compensating for this. The fighters carried on the platform is greater than most fleet carriers and they are the main long range striking ability of the system defense platform. Instead of a contra-grav sublight drive, the platform has a magical drive system similar to the Dwarven Iron Ship. The acceleration of the platform is much slower than that of most starships including capital ships. The platform lacks a Rifts Jump Drive and cannot travel between star systems. While the platform is incredibly well armored, it is also protected by a powerful Techno-Wizard force field. The platform is simply too large to have additional techno-wizard spells added although the platform does have twenty-four techno-wizard magical teleporters. The upgraded version of the platform which incorporates many of the new systems carried on upgraded versions of the U.W.W. Battlecruisers. These upgrades are too extensive to be covered along with the standard platform and are covered separately. Both point defense and long range firepower is vastly increased in the upgraded version of the platform. Other upgrades include an additional belt of high tech alloy armor so the platform can withstand greater damage. This space platform design uses modified starship speed and weapon range rules. See Revised Starship Rules for Phase World for more details. 2,210 (210 officers and 2,000 enlisted). NE-SF10 Broadsword or FB-49 Fire Eater (being upgraded to BIF-67 Katana with FTL boosters). In reality this is how much damage needs to be done for a weapon to hit the bridge through the platform’s armor. This ship also has both an auxiliary bridge and a flag bridge. Even if all three bridges are taken out, the platform can still be piloted from engineering but ship is -3 to dodge and all weapon systems will be at local control. Weapon hits near the bridge that do not penetrate the ship’s integrity can injure crew members on or near the bridge. Depleting the M.D.C. of the main body will put the platform out of commission. All internal systems will shut down, including life support and internal gravity. The platform itself will be an unsalvageable floating wreck. This is not a variable force field, but a magical shield that must be completely depleted. Once the shield has been knocked down, it will cost 3000 P.P.E. and require one minute (4 melee rounds) of spell casting to restore the force field. Magic, fire, lightning, and cold all inflict one-half damage. Mass/Weight: 44.8 million tons (40.64 million metric tons) fully loaded, plus up to 2 million tons (1.8 million metric tons) of additional cargo. Power System: Combination Fusion & Techno-wizardry with 20 year life span. The System Defense Platform also has a P.P.E. generator that produces 20,000 P.P.E. per hour / 80 P.P.E. per melee. This P.P.E. can be used to power spells cast by the platform’s crew. Cargo: Cargo Holds can hold up to 2 million tons (1.8 million metric tons) of additional material. Each enlisted crew member has a small locker for personal items and uniforms. The platform’s officers have more space for personal items. Most of the platform’s are taken up by extra ammo, armor, troops, and weapons. Market Cost: The Platform costs 165 billion credits to construct. The platform is not for sale outside the U.W.W. Armed Forces (The platform will not even be sold to U.W.W. member worlds.) Cost does not include embarked craft. Payload: Each cannon needs 1,000 P.P.E. per day to function. Thirty-Two (32) Bottled Demon Missile Batteries: On each side of the hull the platform has eight bottle demon missile batteries. The missiles are literally demons summoned and bottled into a missile and are an aggressive and intelligent guidance system. The evil demons will continue to chase its target until destroyed (50 M.D.C. to the missile.) Bottled demons are slightly larger than mini-missiles and require special launchers. Missiles have a top speed of Mach 10 in an atmosphere have an acceleration of 2% of light per turn in space. This is slightly faster than any starship except if it is exceeding it maximum safe acceleration. Missiles are considered super smart and have +4 to strike and +5 to dodge. Unlike normal missiles, the bottled demon missile does not explode and keeps striking at its target over and over. If the target is destroyed or vanishes, the missile disappears. Batteries can launch on multiple targets each. Payload: Thirty-Two (32) per battery for a total of 1024 bottled demon missiles.